Sunday, 16 October 2016 from 6:00 PM to 8:45 PM + Add to calendar16/10/2016 18:0016/10/2016 20:45Australia/SydneyThe HINTERLANDT ENSEMBLE + OLIVER DOWNES TRIO Album Launch Tour at Hotel Blue, 'Live At The Attic', Katoomba Blue Mountains - Sun 16th Oct 2016The HINTERLANDT ENSEMBLE + OLIVER DOWNES TRIO Album Launch Tour at Hotel Blue, 'Live At The Attic', Katoomba Blue Mountains - Sun 16th Oct 2016 Sunday, 16 October 2016 from 6:00 PM to 8:45 PM (AUS Eastern Standard Time) Organiser Charity Mirow 0409042869 info@fusionboutique.com.au Address Hotel Blue, upstairs "Live At The Attic" 88 Lurline Street Katoomba Blue Mountains 2780 Australia This concert is held upstairs "Live At The Attic" located on the top floor of Hotel Blue. Hotel Blue is located at 88 Lurline St Katoomba, entrance is via reception on Merriwa St. "Live At The Attic" is located through the Parlour Bar / Lounge and up the stairs (2 flights) then turn left and at the end of the hall. Signs will be in place on the evening. Guests are welcome to arrive prior and gather downstairs in the lounge area and take the opportunity to purchase drinks and light meals. 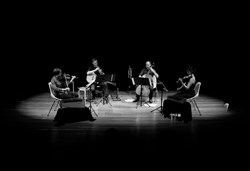 Event web page: https://www.stickytickets.com.au/41726/the_hinterlandt_ensemble__oliver_downes_trio_album_launch_tour_at_hotel_blue_live_at_the_attic_katoomba_blue_mountains__sun_16th_oct_2016.aspxHotel Blue, upstairs "Live At The Attic"